I think I had an experience of that on Saturday, August 22nd, in St Petersburg, Russia, of all places. 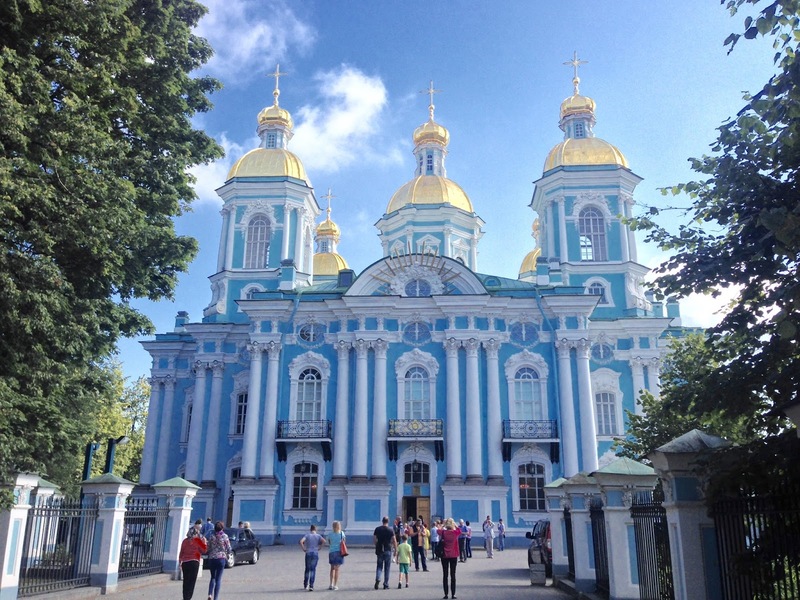 Our Intourist guide, Tatyana, had started our day with a visit to the Naval Cathedral of St Nicholas. Our driver, Yuri, parked the car and we did the usual neck-craning, open-mouthed walk to the door while looking up at the gold-leafed spires gleaming in the Russian morning sun. As we walked through the doors we were enveloped by the most beautiful music. The Divine Liturgy was being sung. What sounded to me like a sixty voice choir turned out to be a quartet in street clothes off to the side and around a corner. Every now and then the young conductor would move to the centre and conduct them and a woman came and went adding and removing sheets of music. They were an informal looking, but certainly not sounding, counterpoint to the liturgical choreography being performed in the sanctuary. The priest and what I assume were deacons moved gracefully in and out of the sanctuary with and without thuribles. Blue incense floated through the gold-leafed Royal Gates. There were few worshippers—mostly women with their heads covered by scarves who would cross themselves reverently and bow every now and then. They came and went, bowing under the rope barrier that separated them from us tourists. The icon shops behind me did their business and tourists wandered about. As has happened for thousands of years, the very God and Father of our Lord Jesus Christ was being worshipped in the Power of the Holy Spirit right in front of me. It was ancient, primeval, holy, and I couldn’t understand a word. Tears sprang to my eyes. I realize now that what was happening was my spirit was responding to the very presence of Jesus in that worship. It seemed very right in its "otherness" and sense of mystery. In Eastern traditions, those of the Eastern Catholic and Orthodox Churches, the Divine Liturgy is seen as transcending time, and the world. All believers are believed to be united in worship in the Kingdom of God along with departed Saints and the celestial Angels. To this end, everything in the Liturgy is seen as symbolic, yet also not just merely symbolic, but making the unseen reality manifest. According to Eastern tradition and belief, the Liturgy's roots go back to Jewish worship and the adaptation of Jewish worship by Early Christians. Time was transcended and the ancient Jewish Jerusalem temple did come to my mind as I witnessed that worship in St Petersburg. In its day Temple worship had nothing to do with the people’s preferences and tastes, other than a few allowances to do with poverty and transporting animals over long distances. God was to be worshipped exactly how and where he decreed and that was it. David acknowledged that when he left the Ark with Obed-edom the Gittite because “the LORD our God broke out against us, because we did not seek him according to the rule” (1 Chr 15.13). I am not a scholar or a liturgical theologian, but I had a sense of a something temple-like going in St Nicholas—an ancient spiritual engine running there as people came and went, most of them oblivious to what was happening. Contemporary liturgical revision has carried us a long way from that I believe I witnessed in St Petersburg. I wonder if it’s been in the wrong direction. So much of today’s worship is about what makes us feel good, or is couched in language that addresses some socio-political issue rather than simply and unconditionally giving glory to Almighty God himself. I wonder if, like Uzzah, we’ve put our hands out to take hold of the Ark of our worship (2 Sam 6.6) because we think it too out of step with our reasonable, postmodern tastes and sensibilities. Will the consequences of our equally well meaning intervention be as costly for us as they were for Uzzah? Meanwhile, in St Petersburg, the Divine Liturgy continues to be sung just as it has through all the vagaries of history including schism in the church and communist oppression and the God and Father of our Lord Jesus Christ continues to be worshipped in some style.